Happy Christmas, chummies! As you can tell from my squinty eyes, it was quite a sunny and warm Christmas day here in Sacramento, which was perfect considering I had no suitable outerwear to wear with my festive ensemble! If it wasn't obvious from this outfit, I love celebrating holidays, particularly by showing it through what I wear--I always dress up on Halloween and will until the day I die, and on Valentine's Day (which is also my anniversary--eee!) 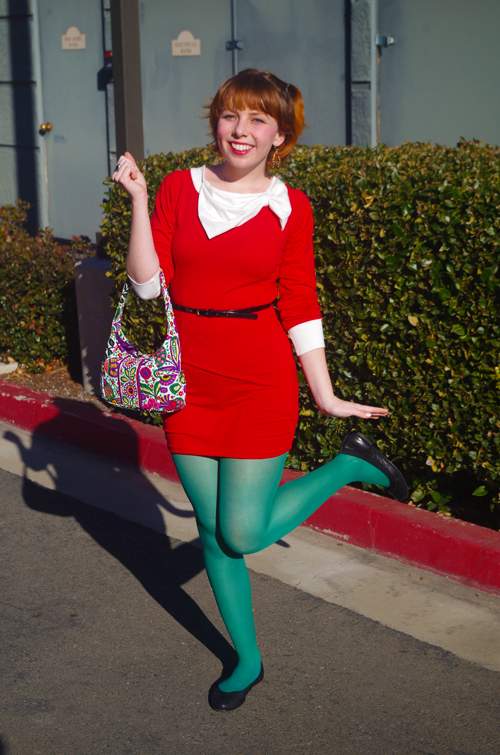 you'd better believe I wear oodles of pink and red with hearts galore! 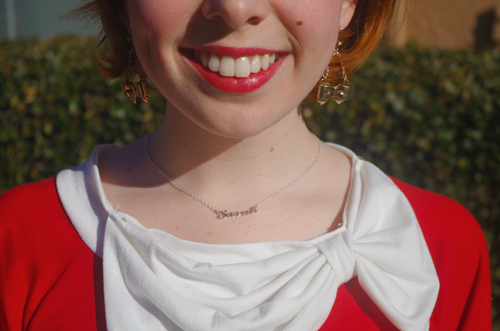 I've never really had a Christmas look before, other than a nice dress for holiday parties, but when I found this dress in my closet, I knew it would be perfect for the occasion--especially with that giant (and slightly lop-sided...) bow on the collar! Every Christmas since I was a Junior in high school, my brother and I started a tradition of seeing a movie in the cinema on Christmas Day! This year we saw The Secret Life of Walter Mitty, which I thoroughly enjoy. Put Kristen Wiig in anything and I'm bound to love it! Do you have any holiday-time traditions? This absolutely perfect necklace was gifted to me by super BFF and all-around amazing human being Summer, who writes over at Pop Culture Puke. In case you can't tell due to the image size, it has my name. A necklace with my name or my significant other's on it has actually been a secret wish of mine for quite some time (you can thank Glee for that) and she fulfilled that longing without even knowing! I can honestly say it is one of my favourite gifts of the day, and look forward to wearing it nearly every day! If you practise holiday gift giving, what was your favourite gift that you gave or received this year? Let me know in the comments! Hope you all had a splendid day, surrounded by those who love you! The countdown to 2014 begins now, so let's make the most of what we have of 2013!